There are some books that I just assume everyone has read. Often, these lines are somewhat generational. For example, I just assume that everyone my age and younger has read Harry Potter. And I had also always assumed that most older women have read Little Women. (I definitely think it is less-read today, but I also think it’s more read than people assume.) For the museum’s book club, we decided to focus this year on books written during our time period (1840-1910) that have been repeatedly mentioned in other things we’ve read. Little Women was at the top of the list. Going into our discussion, I assumed that this would be a reread for everyone–though it had probably been decades since they had last read it. But almost half or our group had never read it! This led to a really interesting conversation about why they had missed it and what it was like to read it for the first time as an adult. Everyone liked it, though I’m not sure if our first-timers loved it. Frankly, I was even more surprised because all of these women love history. It seems like there are certain books that all of us history lovers (especially the women) have in common: Little Women, Little House on the Prairie and Anne of Green Gables seem to be the three most common. We also chatted a bit about what books they had read, and not a lot of historical fiction came up. Though I still believe kidlit history is one of the best paths to history, it is good to be reminded that there are many ways to become a history fan. As you know, I have often incorporated my own love of children’s literature into museum programming. 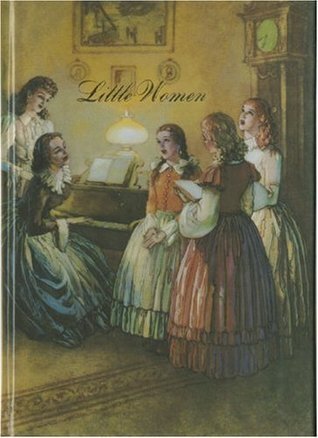 During our Little Women themed event about a year ago, one of my most devoted junior historians confessed that she hadn’t read any of the canon–or even those of the “secondary” canon–Frances Hodgson Burnett, Maud Hart Lovelace, etc. We might have teased her. I might have threatened to kick her out of the program if she didn’t read at least one of my favorites. I might have sent over her buddies (who had read all of the required books!) to give her a hard time. Don’t know if she ever picked anything up, though I still allow her to be a junior historian. So, what titles make you say “I can’t believe you haven’t read that!”? What’s in your kidlit history canon? Some books are a pretty easy sell for me. A YA romance set in a living history museum? The only shock here is that it was published last fall, and I’m just now getting to it. Leila Sales’ Past Perfect is absolutely delightful. Now, it might not be as funny to non-history nerds, but I was laughing hysterically by page 2 and giggling throughout. One of my favorite parts of my job is the junior historian program. Right now, I have around 30 kids, ages 11 to 18, that are choosing to spend their spare time hanging out with me at the Village. This book is all about the teen junior interpreters, who happen to be at war with the other living history museum across the street. They are colonials, and those other guys are Civil War re-enactors. Of course, there’s also forbidden romance, some museum politics, and ice cream. Lots of ice cream. Chelsea, the main character, doesn’t want to admit that she’s totally hooked on all of this (she would have rather spent the summer working at the mall, in air conditioning), but history is part of her blood. My favorite parts, obviously, are the parts about working at a museum. I’ve known tourists (called moderners here-the one part of the book that just felt odd to me) exactly like the ones portrayed. I kept thinking about my kids while I was reading about these fictional kids. To the best of my knowledge, we haven’t had any actual romances at the Village, but there have been some crushes. We definitely have some kids that are classic history nerds, some that really just want to dress up and create a character, and some that have been raised in the living history world. But all my kids are there because they want to be, and that’s one of the things I liked most about this book–all the characters loved what they did (even if they did it for different reasons), and they were proud of what they did. There was no shame in spending your summer in colonial dress. There are so many passages I want to share with you, enough that I worry about copyright infringement or something along those lines. But I still have to share a few bits. Type one: history nerds. People who memorized all the battles of the Revolutionary War by age ten; who can, and will, tell you how many casualties were sustained at Bunker Hill; who hotly debate the virtures of bayonets over pistols. They are mostly pale-skinned, reedy, acne-scarred boys in glasses (unless they can’t find a pair of historically accurate glasses and are forced to get contacts). I don’t know if they were born so unappealing, and turned to history for companionship because they realized they were too grotesque to attract real-life friends or if their love of history came first, and maybe they could have turned out hot, but invested all their energy in watching twelve-hour documentaries about battleships. It’s a chicken-or-egg type of question. This is far and away the most common question. You don’t actually need any sort of historical knowledge to work at Essex. You just have to know where the nearest toilet is. These are pretty much the only questions people ask Colonials. If they want you to tell them anything else, just make it up. They will believe you, because you are wearing a costume. This is not a book that will change your life, but I’m still recommending it to just about everyone I know. It’s so rare for history museums to be portrayed in popular culture, much less living history museums. And it’s pretty accurate–from the employees and volunteers that are obsessed with historic details to the weird questions visitors ask. I have met, at one time or another, every single character in this book. Of course, they have a much, much larger staff than we do and there are no conversations about budget cuts and declining visitation. But I can live with that–and most teens wouldn’t know anything about budgets anyway. It’s a book that’s funny without being mean–she makes jokes about this crazy world, but they were al jokes we’ve made before. And though Chelsea does something very damaging to the museum across the street, well, it’s the kind of scandal that does happen in the museum world. The author biography on the back flap mentions that Sales spent some time as an interpreter on Boston’s Freedom Trail. It shows, and I think that’s part of the reason this book works so well. Sales has been a part of this world, but she can also separate herself enough to find the humor in all of it. Because let’s face it: little about my workplace is ordinary. Bonus: after checking the author’s website, I discovered that you can read Past Perfect online for free through the end of February. Go! Enjoy! On Saturday, I had a pretty magical experience. It was our annual Girl Scout Day, featuring the books of Laura Ingalls Wilder. We scattered beads at campfires, had a full supply of buttons, and were ready to help visitors make sunbonnets, if they hadn’t already arrived wearing them. We also had a costume contest–and ended up with over 30 participants, far more than I had dared to hope. It was a fun day! But for me, there was one moment that was particularly magical. We had set aside two different half-hour blocks of time for me to read sections of the book. In the morning, I read “Fire on the Hearth” and “Indian Camp” from Little House on the Prairie. In the afternoon, I read “School” and “Town Party” from On the Banks of Plum Creek. Have I mentioned yet that I read this in our historic schoolhouse? Granted, our school is a wee bit bigger than the one described. But the desks are similiar. And the slates. And the blackboards surrounding the room. There was a certain moment, as I was reading Wilder’s description of that school. that I looked up at the room. The girls that were listening almost had this “eureka!” look on their face–they were sitting in desks almost exactly like the desks described in the book. A slate was in front of them. Suddenly, the boundaries between fiction and reality, past and present, Minnesota and Texas almost vanished. Maybe it’s hokey to say this, but these little girls were at one with the book. As a musuem educator, I wish we could have such powerful moments every single day. And I think, as a museum, we’re closer to that goal. As someone who has always loved children’s literature, there is nothing better. As part of my introduction, I asked visitors how many had read the books. Lots of hands went up. And then I asked how many wanted to read the books after Saturday. Almost as many hands went up.